Little Painted Nails: Lower Your Expecations and Save Your Weekend! Lower Your Expecations and Save Your Weekend! Not so long ago, my daughters played soccer to have a good time. They played in soccer tournaments for the opportunity to stay in a hotel and have unfettered access to a pool and the guarantee of dining out multiple times in a few days’ time. We paid a lot of money for tournaments, what we got was ice cream and chlorine. 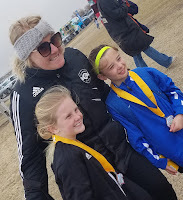 Macy, my nine-year-old had a tournament in Denver this past weekend. We were sure to get a hotel with a pool for the kids and free breakfast for my wallet. In years past, the prospect of the hotel was enough. That just isn’t true anymore. She spent the days leading into the tournament talking about winning a medal, pitching shutouts and shots on goal. Ugh, who are you. Where is my little Star Wars fan? A day or two before the tournament we got an email saying that a local team in my oldest age group needed players as well. Avery plays with a team that is a year older than she is, but she was excited to play with her own age and there were a number of kids that she had played with previously on the team. But I knew in my heart of hearts that this little girl played for the love of the game. Winning and medals didn’t mean as much as it did to Macy, hell, it wasn’t even her team. Avery started talking about how good this team was and that they had a real shot at the tourney. I knew this was going to be a long weekend. The first day went okay, it was “fine” but not spectacular. Avery’s team got rolled in their first game. The other team was awake and looked to have drank at least a few cups of coffee before the game. Our girls looked like they had spent at least a few hours in the pool. Note: they had. They lost 3-1. Macy played a couple of hours later. They were more awake. A lot more awake. They jolly-stomped the poor team they played. They won 6-0 and took their foot off the gas in the second half. The scoreboard didn’t reflect how bad it was on the field. Avery was up next. The temperatures were dropping and even the most enthusiastic of parents were beginning to lose interest. Her team didn’t lose interest. They won their game 3-0 and the team played with the skill that Avery had talked about. Now, I don’t know what the parent hoped to accomplish, but I can tell you exactly what happened. Smiles spread across the girls faces. One girl raised her arms in victory. One audibly squealed. The other team heard it, too. But they didn’t raise their hands or squeal. They had what could be described as an ‘increased sense of urgency’. A couple of seconds later they ball was in the back of our net. 2-2 tie. The loss for Avery’s team and the tie for Macy’s team meant that they had to count on other teams to get them into the finals. Avery’s team still had another game Sunday morning. Macy’s did not. Avery’s team won the morning game 3-0. They had a shot. Macy’s team looked like a long shot. Both kids knew where their respective teams stood. Both were surprised, Avery not so pleasantly. Avery found out at noon she wouldn’t have another game. We tried to console her in the fact that she finished third in a very tough division. She was consolable, but only to the point that she wasn’t ‘Old Yeller’ broken. Macy’s game wasn’t until three. It was going to be a long few hours. The game would go on. We sat anxiously as the game started. They had a tiger by the tail. They got to halftime with a surprising 1-0 lead. We kept waiting for the tiger to break free. A minute into the second half, the game was tied. “Uh oh” we thought to ourselves. We kept waiting for it to turn ugly, but that little group of girls kept the game exactly where it was. The game finished 1-1. Soccer allows for ties, right? Usually, but not in the finals. It would be decided with a shoot-out. This was where the extreme size difference between their team and ours took full display. These sasquatches of children lined up five feet from our goalie and our little angels did the same with theirs. Long story short, they aren’t Cinderella stories because they always come though. They took second. Macy was crushed. Macy got a second-place medal. Avery was crushed. These are two little girls who went through years of tournaments without winning a game. I remember one particularly bad one where Avery’s team didn’t score a goal. They never seemed upset back then. The lessons here girlies? There’s a few. I like you being disappointed by losing and I like you having the expectation of winning. It’s healthy. On the flip side being leveled by losing isn’t great. Both of you played well, your teams did great and everyone involved had fun. Maybe you didn’t get every single thing you wanted out of it, but you should appreciate what you did get. There is also something to be said for what you do with losing. You can sit and cry in the back of the car for an hour and a half. You can let it ruin the end of your spring break. Or, you can ask what happened. What went right and what went wrong. Celebrate your wins and evaluate what you can do to prevent your losses. Listen to the coach after the game and figure out what is needed to help your team next time. All of that being said, winning medals is fun, winning tournaments is fun, I get it. So, don’t just hope to win them, work your little tushies off to make it happen. Keep working hard and it’ll happen for you. This is one of my favorite of these blog posts that you've written. Nice work.